Imagine meeting a prospective client about a new website development job. The project is ambitious, but you know you’re the right person for the role. The client is perfect; friendly and realistic, plus they would add a lot of pedigree to your resume. Best of all, the money is good – great, in fact. This is pretty much the dream scenario, right? Now I want you to imagine how this scene might play out based on which of these two responses you give the client. Both are valid email addresses, but they elicit completely different responses, don’t they? If you have serious ambitions to land this high-profile gig, the Gmail one just doesn’t cut it – it’s unprofessional. As you’ll quickly realize when running a small online business; professionalism is King. Clients need to know that you can not only do the job, but also that you can deliver on time, on budget, and with the minimum amount of hassle. A dedicated business email address – one that ends in your domain name – might not land you the job, but it certainly won’t cause clients to lose confidence in you. As such, it’s an important piece of the puzzle. Everyone should have one, and, if you don’t already, get one now! However – and I speak from personal experience here – business email addresses are a nuisance to maintain. I access my business emails via my hosting company’s email client. The clumsy UI makes this feel like a huge chore, and sometimes this results in me missing important messages. This is a big problem when email is my only line of communication with my clients. Contrast this with accessing my personal email using Gmail, which I find far more convenient. Despite the relative unimportance of the emails I receive, I still find myself checking my emails four or five times a day. When it comes to email, Gmail wins for me, hands down. If only there were a way to check my business emails with Gmail… Well, now there is! Today, I want to show you how to setup a business email address ending in a custom domain using Gmail. Before you can achieve this, though, you’ll need to sign up for Google Apps for Work. Google Apps for Work is a cloud-based productivity and collaboration tool. It is a premium service, costing from $5/month/user if you’re in the US. Prices vary by country; for example, UK users face charges from £3.30/month/user. Gmail – handle business emails using the familiar Gmail client. Calendar – organize meetings and sync your team’s schedule. Drive – store and share files in the cloud. Docs – share documents in real-time with your team. Sheets – build, share, and edit spreadsheets with your team. Slides – create professional, PowerPoint-style slideshows. Sites – launch an intranet-style resource for your business. Hangouts – conduct HD video conferences and group chats with team members. As you can see, the full suite provides the complete infrastructure a small business needs. However, the purpose of today’s post is to walk you through the steps necessary to create a business email address using Gmail. First, let’s dig a little deeper. What Are the Benefits of the Paid Version of Gmail? With so many great email clients available for free, what could possibly persuade you to open your wallet and spend your hard-earned cash? Well, as we’ve already touched on, the primary benefit of premium Gmail is custom email addresses – emails ending in your domain name. This means you can send and manage your emails using the excellent Gmail interface while still retaining an aura of professionalism. A free Gmail account comes with 15GB of storage. If this isn’t enough, the paid version of Gmail expands this capacity. The Base subscription (costing $5/month/user) grants you double the space – that’s 30GB of cloud storage. If this isn’t enough, simply upgrade to a Premium subscription for $10/user/month (or your country’s equivalent), and receive unlimited cloud space. Users can also create up to 30 email aliases. This makes it ideal for small businesses, where one support staff might handle all business emails – you can maintain multiple email addresses, but you won’t end up paying through the roof. Want more? Premium Gmail guarantees 99.9% uptime, round-the-clock support, and zero ads. It also offers migration tools to help you move your email system across from other popular services, such as Microsoft Outlook and Lotus Notes. If you want to dip your toes, Google Apps for Work also offers a 30-day money back guarantee. In this section, I’ll walk you through the steps required to setup your new business email address with Gmail. First, though, you need to sign up for Google Apps for Work. As stated above, you can take it for a test drive with the free trial – this process won’t ask you for credit card details either. 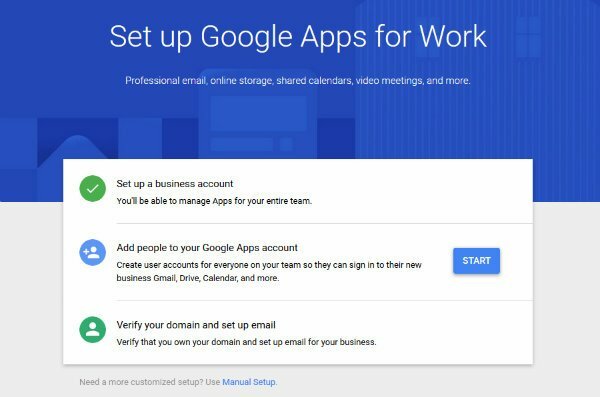 Just visit the Google Apps for Work website, then click on the green Get Started Now button. Next, fill out the simple form asking for details about you – name, current email address, business name, business size, etc. The next step is to confirm the domain you wish to use: do you already own it, or would you like to purchase through Google, with domain prices starting from $8/year. If you’re yet to purchase your domain, setting up your email address is super-easy – Google will configure it automatically. However, if you already own your domain (and I’m assuming that’s most of you), you will need to prove ownership. Go ahead and input your domain name when prompted, then hit Next. The next screen will ask you to create a Google Apps account using your domain name. Pick carefully, as this will function as your business email address and also your Google Apps admin account. Don’t worry, though: you can create new email addresses at a later stage, and the process won’t be as cumbersome. 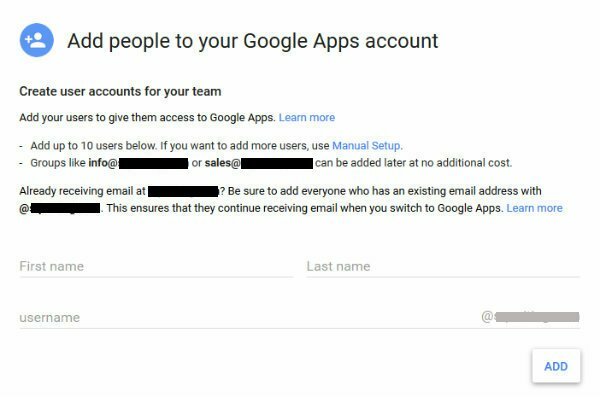 From here, you can begin adding team members to your Google Apps account by clicking the Start button. It’s recommended that you add everyone using an email address at your domain during this step. When you’re done, check the checkbox then click Next. The final step is also the most complicated: verifying your domain. 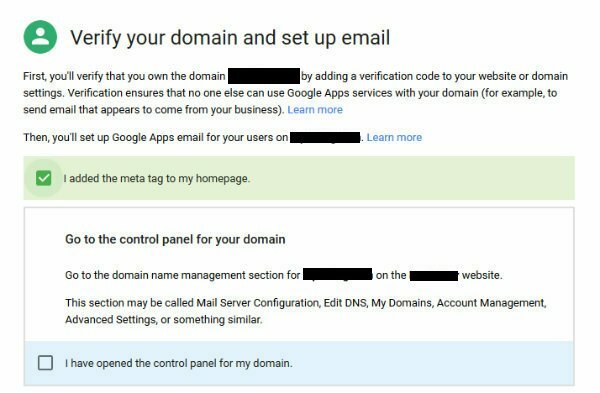 However, this is an important safeguarding feature to ensure that only the domain owner can access Google Apps for Work on any given domain. 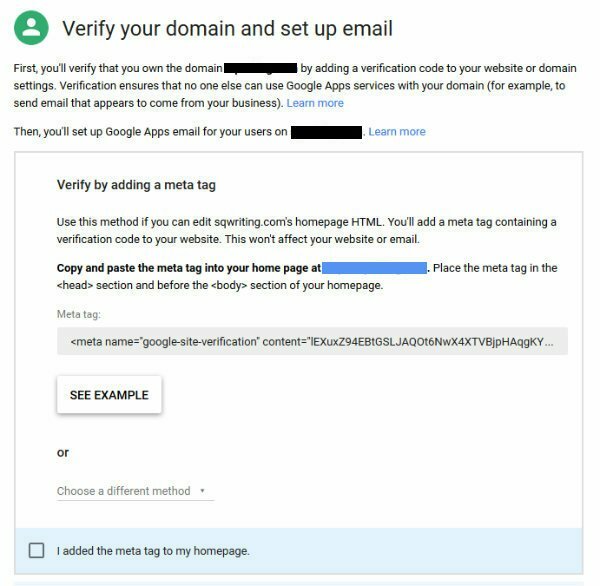 The easiest way to verify your domain is to add a meta tag verification code to your site’s header. However, if that approach is not for you, you can also upload an HTML file to your site, or add a domain host record. For the purposes of this tutorial, we’ll be adding a meta tag, as supplied by the Google Apps sign up process. This requires you to login to your WordPress dashboard. Although there are several ways to add a meta tag, the most beginner-friendly option is using the Insert Headers and Footers plugin. 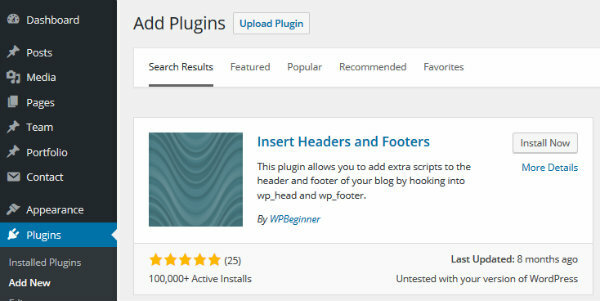 To install it, navigate to Plugins > Add New > search for ‘insert headers and footers’ > Install Now > Activate Plugin. To use the plugin, click through to Settings > Insert Headers and Footers. Now, all you need to do is paste the code into the Scripts in Header section of the screen. When you’re happy, don’t forget to click Save. Now head back to Google Apps and check the “I added the meta tag to my homepage” box. So far, so good. 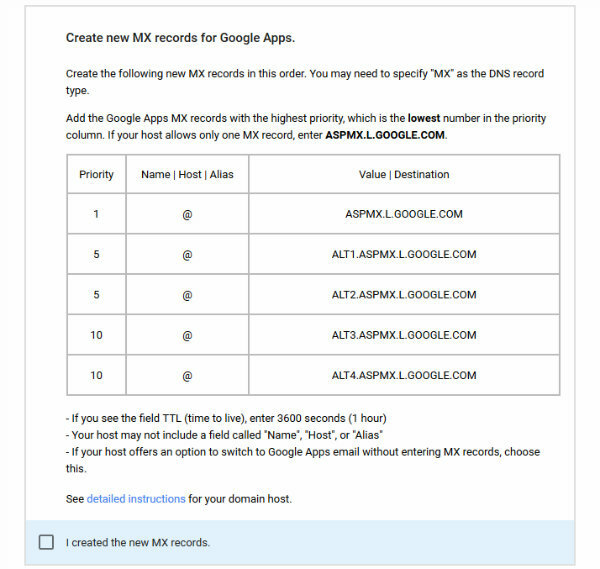 The next step is to configure your domain’s MX records. This will ensure your emails are sent directly to Gmail’s servers, letting you use the Gmail service with your custom domain. This requires you to access your hosting account. Now, this process varies from host to host. For those of you using a web host with cPanel, you can continue following along with this tutorial. If this doesn’t apply to you, don’t worry: Google has provided detailed instructions for over 100 hosting services. Find your host on this overview page, then click through to follow the instructions. Login to cPanel, make your way to the Mail section, and then click MX Entries. Now select your domain from the drop-down list. Heading back to the Google Apps setup screen, check the “I have opened the control panel for my domain” box. This will open up a new section, giving you the new MX records you need to supply. Add these one-by-one to the cPanel screen. 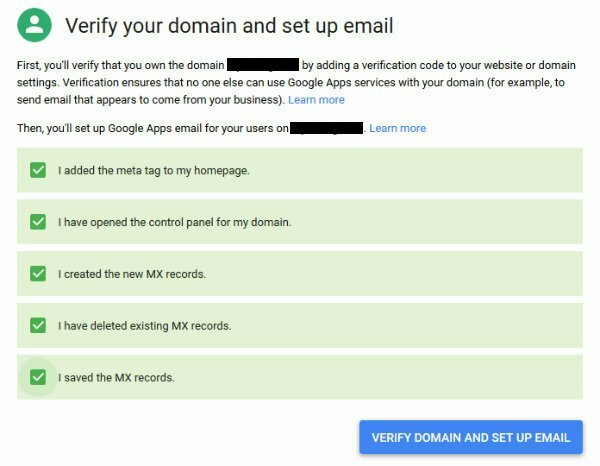 In the Google Apps setup screen, tick the box next to “I created the new MX records.” Now you’ll need to head back to cPanel and delete any of the existing MX records – any non-Google servers. When you’ve done this, tick the “I have deleted existing MX records” box. Next, click “I saved the MX records”, then finish up by clicking the blue “Verify Domain and Set Up Email” button. Now you’re all done! Google will begin rerouting email directly to Gmail, though this process typically takes 24 to 48 hours – and anywhere up to 72 hours, depending on your hosting provider. Before you finish, be sure to set up your billing details, so that you can continue using Google Apps for Work after your trial period. And with that, we’re done! Now you’ll be able to log in to Gmail using your business email address. Once you’re logged in, you’ll be able to send and receive emails using the familiar Gmail interface. It might seem like a small thing, but being able to communicate with clients using a professional email address and a user-friendly email platform really will make your life easier. If you disagree, you can easily cancel your Google Apps for Work subscription and go back to your old email client – and the trial won’t have cost you a penny. For me, though, Gmail is my favorite email service, and well worth the $5/month to use the service professionally. If you’re using Google Apps for Work and the premium Gmail service, share your thoughts and experiences in the comments section below! Thanks for the tips. What’s the benefit over using POP3 and send as other than near instant receiving of mail? The receiver doesn’t see the different as far as I can see. Just yesterday had to create some addresses for a customer, didn’t have a problem, but if I had read this article beforehand would have saved me a couple minutes of work. Will save this for the future . I’m sorry, but if you call yourself a developer you certainly shouldn’t have to pay Google to get a customised email address. If you can’t set up an email address for a domain you own with a desktop email client, you really are not skilled enough to be charging for web services. I think more than just web developers (or budding web developers) will find this information useful. Particularly DIY WordPress users creating their own websites and online presence. I don’t think the ability to set up an email account is the only consideration to make. Many VERY experienced developers choose NOT to host their own email on security grounds. It is more about security than the ability to create an email account from cpanel (which needs no development abilities). With the Hosted emails notorious for data loss / hacking, the ability to leave all the security headache to Google sounds a better proposition. For those looking for a reliable free option, first forward all your business emails to gmail itself. Then there is an option in gmail to use their SMTP server to send mails using your business email address. For clients and friends that have only one email to forward, I always recommend the free method Mike Angel mentions with an alias. When it gets into more than one email account, I might start recommending Google Apps. There must be good affiliate money to made though that helps bloggers ‘forget’ that free option. This is what I do as my web host mail servers are really bad at catching spam. I had to create a separate Gmail account so that it’s not tied to my personal one, but all my domain mail is relayed through Gmail servers to use their Spam protection and it works. Although it is a pain when sending out email on my phone or Apple mail because when I go to send a message it want’s to default to my Gmail account which I do not want to be using as the sent from account. I have to manually select from the drop down and sometimes I forget. Also if I reply to an email before it get’s copied to my Gmail account it may or may not show up in my sent folder and sync across all devices. Also If I read mail before it’s forward to Gmail then I have to read it again b/c it’s see’s it as a new message on the server. But it is free and the only option I have found without paying for an Exchange Server. I do this and it’s a nice solution. The only draw-back I’ve encountered is that my “business emails” take a bit longer to hit my inbox as well as the recipient’s inbox. So far it hasn’t been a problem. Most emails do not need to be instant. Not any more. You used the be able to forward your emails to gmail (multiple inboxes) and even respond as them from your gmail account. Unfortunately Google removed this feature about a year ago as this is now a ‘paid premium’ feature. You can still forward your emails to your account, but you can’t respond as them any more. This does not affect previously set up email forwarding that were set up before this feature became ‘premium’. However you can actually do the same with Outlook now. I revisited Outlook because this important feature was taken away from gmail. Works great on Outlook and there are no limits to the amount of email addresses you can link to the account. hmmm…I’m doing just that with a free account. Chris, could you give me a primer on starting this on Outlook? I read your article Shaun. I tried the free trial of Google Apps for Work. It worked fine for me but all of my other Google services such as Google + and Google Drive were still associated with my free Google account. I found that I had to log out of my Google Apps for Work account and log back into my free Google account just to access my Google + or Google My Business apps. To the left of the sign out button is the ‘Add Account’ button. Click on it and add your personal gmail account details if you are logged in to your work account or vice versa if you are logged in to your personal account. Doing so will allow you to open both your work and personal accounts in separate tabs side-by-side. Email is going to become more of a problem for businesses as hackers and spammers cause more servers to be blacklisted or greylisted and more legitimate email ends up caught in spam filters. I’ve had 2 clients who had to switch from email hosted at their web host. Gmail is one of the options we looked into, but it’s not the most cost-effective, especially if you have a number of staff members who need email. The “free” option looks like a good one. I wonder how long until Google figures out how to pay something to make it work. Beelissa, there are several other options that are more cost effective. RackSpace Email – $2/inbox and they have free assisted migration. Zoho Email – Free for up to 5 inboxes I think which you can still use your own custom domain. Most of these blogs are useful. This one however, leaves me scratching my head. When you log into cPanel simply go to your emails and it will give you the settings you can use with your own email client: laptop, MacBook, iPad, and/or iPhone/Android device. It’s very easy to do. Not sure why this wasn’t mentioned as a solution without having to use Google. if you can create web sites, log into cPanel, and reroute using Google Apps you can certainly setup email accounts on your iPad. Today is my first day to pay. Already been in trial for a month. It is good and you can make alias email up to 30 email address. It worked like a charm for me – up to 50 spam messages per day now gone! Wow. That’s a lot of junk out of your inbox. Congrats! We’re a Google for Work Partner and have converted all our website hosting clients email to Google for Work which is easier, more reliable, faster, more secure, does a great job detecting spam and malware, works great with Windows, Apple, Android etc and is a bargain. And they take a bit of adjustment from years of using Microsoft Office, but the Docs, Sheets, Slides, Calendar and other apps are GREAT. Totally agree. It’s a much better option all around. Some speciality cases might linger–advanced spreadsheet stuff, for example–but you can still use those other programs where needed and have the benefit of better email and collaboration tools for the whole organization. If you’re concern about privacy, you may want to use protonmail instead. It offers end to end encryption and it’s servers are based on Switzerland, outside US and EU jurisdiction. Therefore, you don’t have to worry about big brother snooping on your email communication. As far as custom domain is concerned, protonmail also provides this feature in its premium package. A very detailed guide on how we can create a business email address with our domain name. Using your guide, I successfully made my first email address ending with my domain name. I switched to premium Gmail this past month. My domains and sites have been with Bluehost since 2005. I have had many issues with email, spam and blacklisting due to shared servers. Gmail has resolved all issues and stops spam. Glad I switched, this was a good timely article. Or simply retrieve the e-mail from your host with your favourite e-mail program. And if you do that with IMAP you can access it from your computer, laptop, phone, tablet and the web. We do this as standard now as it’s a great service and easy to set up, although we often sit down and go through the process with each client. Taking email away from the web hosting is also a safer way in my opinion, as if the emails go down the site does too and vice versa. Gmail for business helps sort that out. Google apps is a Time-saver = money-maker. Be sure when you set up you check one user and add as you need or you’re paying for unused user accts with no easy option to downgrade. And if you leave ggl apps be sure to download all history & data cause when you cancel paid even for free gmail, all that disappears. Sad. Formerly Google Apps is free. Gmail / Google apps is good with Spam protection. Same time I m noticing good promotion mails are also hitting spam. And I really the free plan and using Zoho Mail for my small projects. we get so many clients that do not have a business email address which is such a shame as like you say it really lets their business down. They have came back to us after having their email set up and are really pleased with the positive response they get from potential clients. It does make all the difference. We don’t use this method to sort there email client out however, we just provide tutorials on how to set up any device for there email clients and because we give each customer there own Cpanel they do not need to log into Cpanel to view there emails they simply go to /webmail and it’s easy to log in there from any browser if they cannot use a client or app to view there mail. Gmail no more offers free custom domain email address but paying $5/mo is really worth ! We use it for many clients here just because Gmail is very good in catching spam email!. Is there something like this for Outlook? I’ve been using it so long it’s second nature and I have about 10 sites forwarding to it. Thanks for sharing this expensive information here. Surley its cheaper to set up an email address of your business site. Then set up using either Gmail or anywhere else that brings you your email? Its free apart from anything else. Hi Nathan!, Thank you for the walkthrough, im sure a lot of people is going to appreciate it. I´m just a little bit confused by one thing, is it $5 a month for each email address, or for a user that administrates up to 30 email accounts? Thanks in advance!